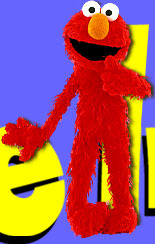 Elmo is one of the newest and most playful members of the Sesame Street monster family. In fact, he can turn almost anything into a game, and then invite friends to join him in imaginative fun. Elmo's fire-engine red fur and sunshine nose are almost as colorful as his personality. Favorite game: You name it, he'll play it. Horoscope: Elmo, like Ernie, is an Aquarianincurably friendly, curious, and full of surprise. Philosophy: Give love and you shall receive love. vivi's word : hahaha~Elmo is so cute!!!! hehehe~ Just like me, always "hehe~hahaha~" tickling around~ That's why i love Elmo so much!